It’s the season of warmth and comfort here. Why don’t we look on the inside, stay at home longer and see our days through the colors of brown sugar? The third spectacular season of the year deserves decorations, festivities and time with the loved ones more than ever. Yellow, orange and red become the prime color scheme in a resonance of summer that didn’t last forever once again. Seasons change and highlights in our hair will miss the sun rays, but we know it’s time to let go, right? Think of our homes like palettes for the creative touch of our hands! We both know your one and only real home is on the inside – that place of knowing, comfort and peace within. But don’t underestimate the power of creating the atmosphere you desire in your surroundings, though! 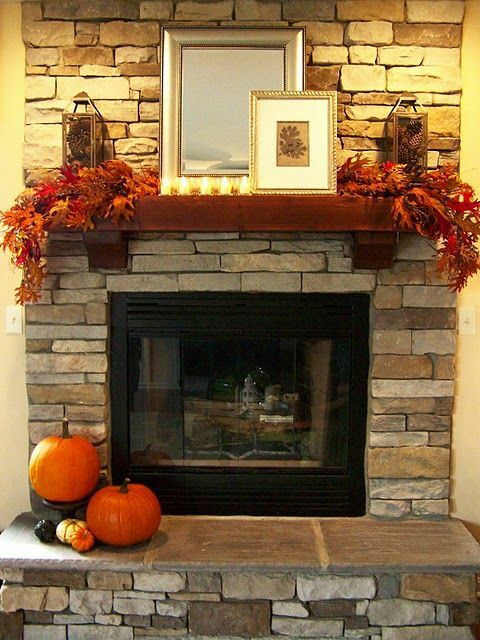 Isn’t it the time to decorate your mantel and have your own little nook in the house? Take a look at twelve decor variations below and have some fun while I walk you through my inspirations. 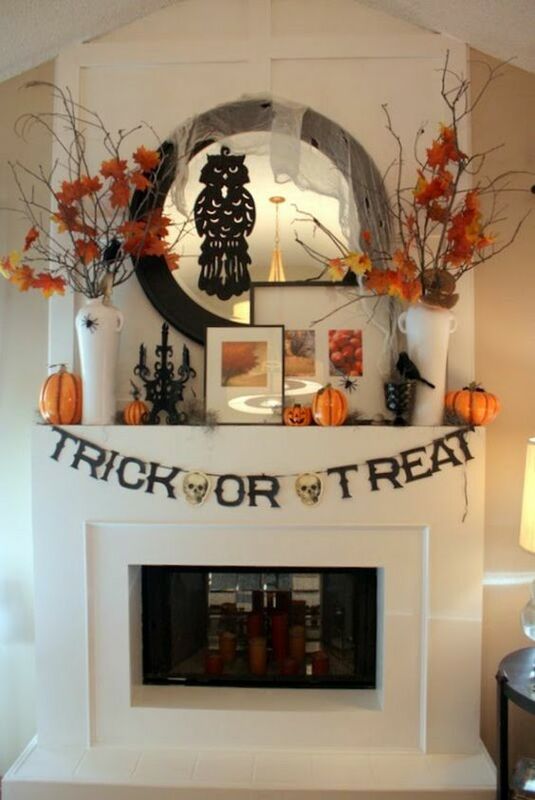 Trick or treaters and all devoted pumpkin eaters would like this one. The seriousness of the owl might easily spark a conversation. The popularity of these creatures rose so much in the past couple of years for home decors, t-shirts, and jewelry! The nocturnal creature is a symbol of wisdom and seeing beyond the cycle of life and death. 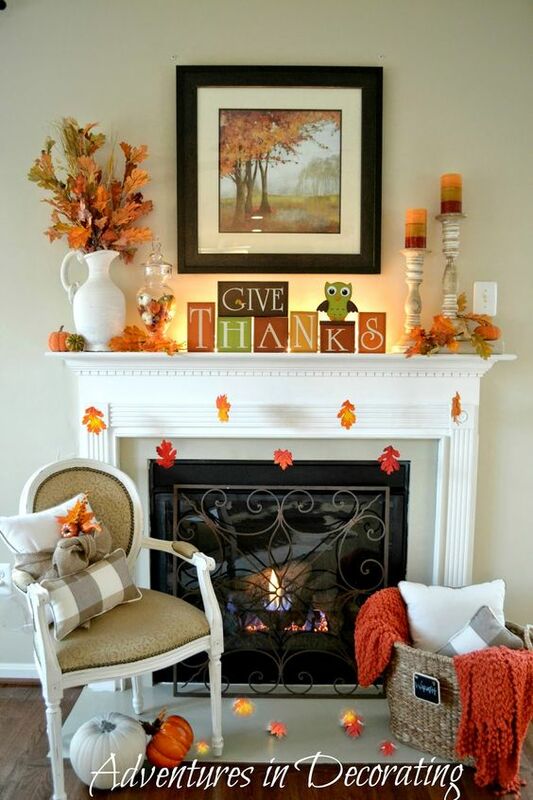 What more can you possibly need besides a cozy fireplace, a nice tall glass of pinecones and lovely cotton decorations? Water in tall bottles on its own can create an eclectic mystery of nature’s forces. Let’s light up your imagination. Sit with me, while I tell you. Autumn’s here and it will stay for a while. Shhh… it’s still a secret. 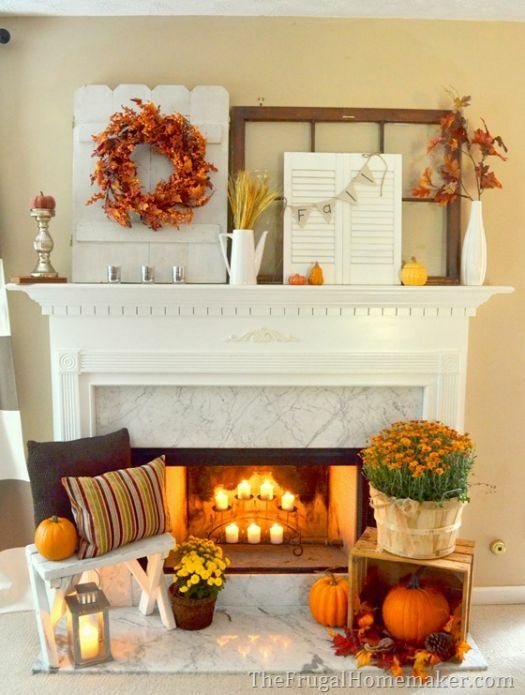 Orange wreath, pumpkins, autumn leaves, and a lantern. Why don’t you take a walk in the park and gather some leaves that have fallen on the streets? Light a few candles and put some cozy pillows in earth tones. Time to redecorate! Taking the creative control often means letting go and changing the scene a bit. 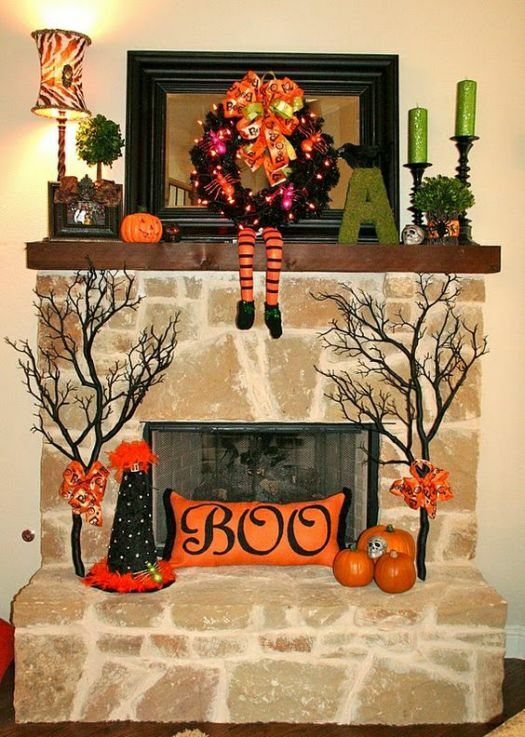 Both sweet and a terrifying – this is the trademark of this little decor. I adore the long hanging feet of small toys over the book shelves or the mantels. And regularly find them in these places. The dark bare branches of the trees may creep you out a bit, but by adding the wizard hat it really is perfection. 5. Thank You for Being Here! The words we speak are often not enough. Why not say thanks a little differently this year? This lovely reminder can be easily drawn by yourself on a blackboard or thick paper. Change the message every night, so in the morning your folks will be surprised one more time. Some people draw quotes on their bathroom mirrors, but I like inspiration in the living room. 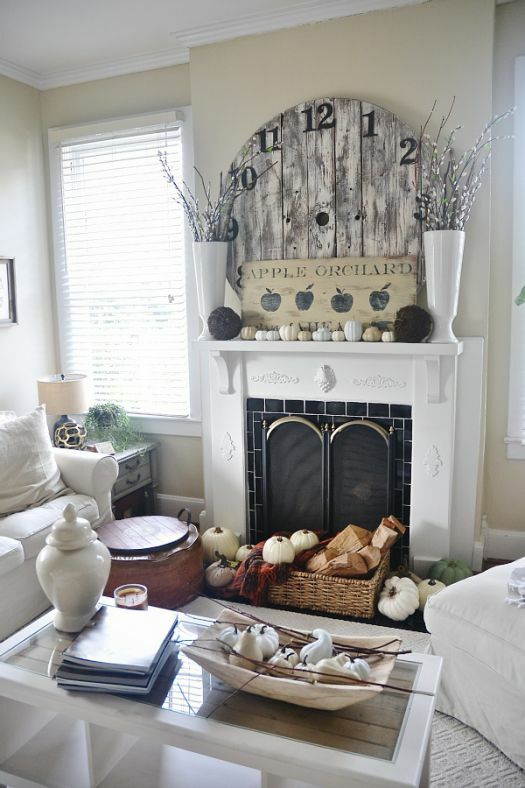 All time favorite white is the classic decor tale of any season. Take the moments to enjoy the white that unfolds right before your eyes. Add some dark color details to warm up the scene. 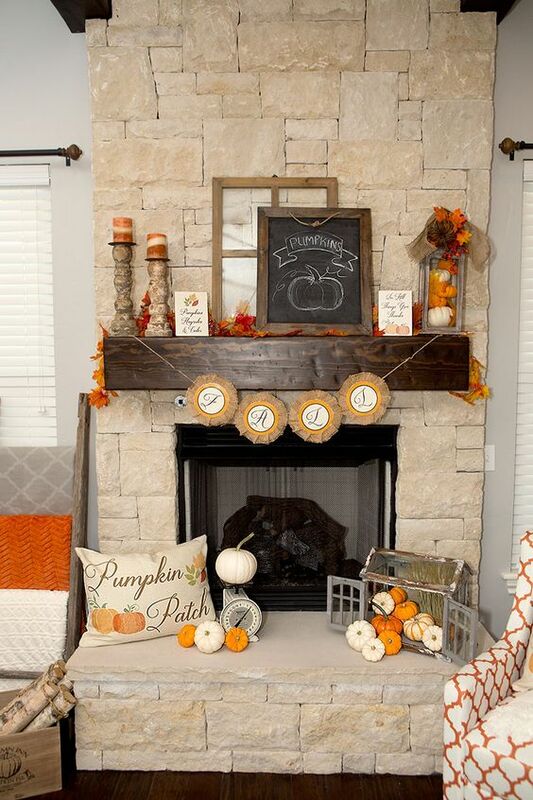 It’s funny, but in here the wood, the dark branches, and the pumpkins warm up the feeling. The taller the vases, the better! 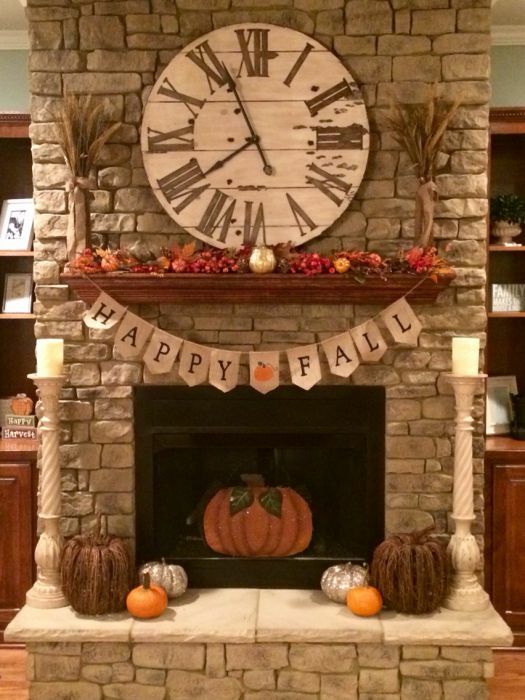 Is it an autumn or is it a fall? Both of them true, but don’t mind if I take the blankets and sleep through the winter. Fill a tall jar with oranges – it’s like bottling a piece of the flaming sun for the winter. The minimalistic pillows are always fashionable. I’d put in the basket a bunch of your favorite scarves, too. The dark huge scary spiders are a sign of an illusion. Much like the mind weaves its own nets. 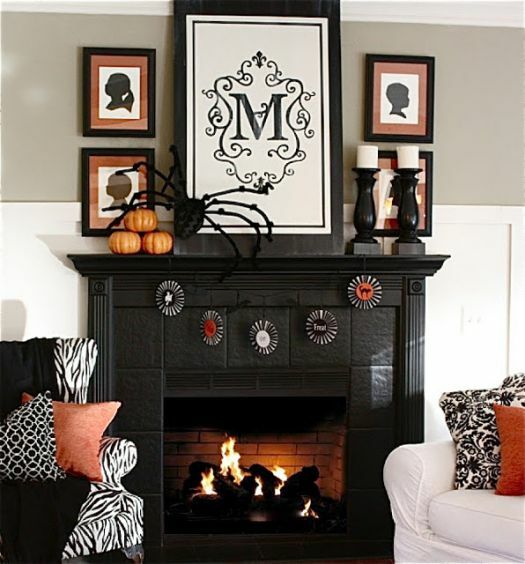 Black and white graphic patterns tend to make a blend with the orange pillows. This decor is a choice for brave ones that care for their style. You can always add or change color by dumping soft blankets on top of either chair. Brick walls remind me of castles and my longing for living in one. It seems to be quite appropriate, considering the pumpkins on display as the princes and princesses of autumn. The unexpected touch is adding little silver objects or some glitter. Dismiss the huge clock if you want to trust your inner rhythm rather than what the arrows tell. 10. The Brightest Star is You! 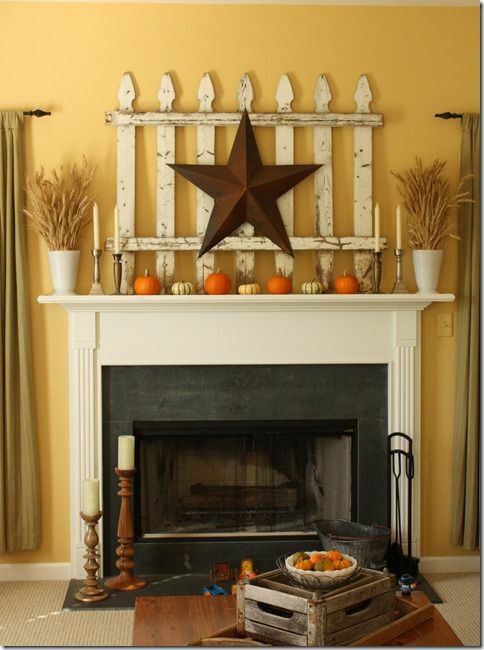 Brown star, wheat stems and your own personal growth – that is what this decor brightly represents. While it’s a mature choice, there is also the momentary feeling of nostalgia when you look at the beautiful white fence on the wall. Tom Sawyer wasn’t all good and responsible, though, right? 11. Have I Been Here Before, Dear? While everyone wants everything to be brand new, sometimes we find much comfort in what we already know. Add in the comfy chairs and see how the different materials collide and play. 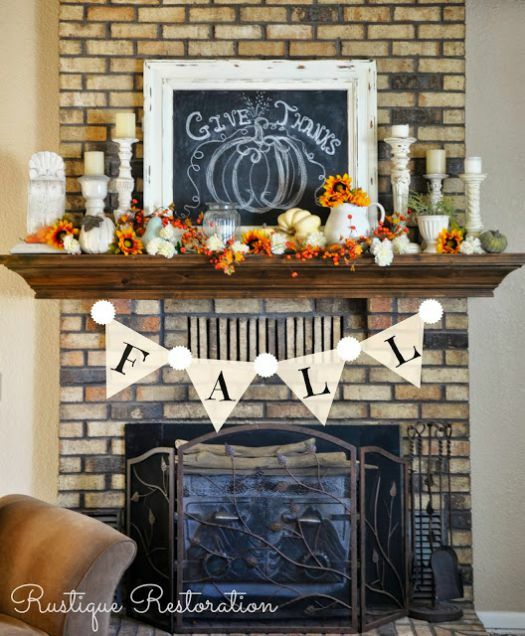 Each one of these twelve home decorations can make the perfect background for a family photo, for a friendly gathering or an absurd costume party. Delightful pinecones once again and mirror-like frames that create a stylish view. 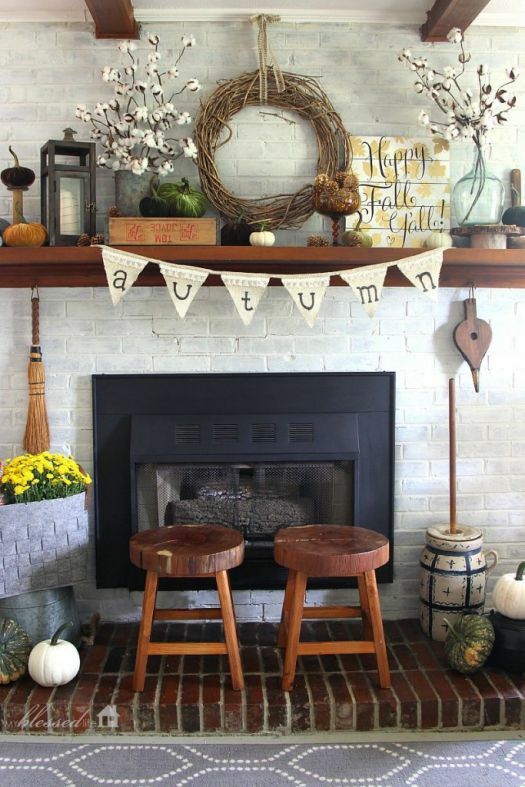 Try adding an uneven number of colorful objects such as pumpkins, leaves or other natural materials and the result will be unforgettable. Play and have fun as much as you can! The autumn season is in, and we crave to look into our own nature with ease and love. Unique occurrences appear when you let things follow their natural cycle.